Designed for the most experienced motorcyclists who expect the very best in terms of technology, performance and components, the Monster S4R S Testastretta sets new standards for the Monster family with the application of Ducati experience gained in the World Superbike Championship. 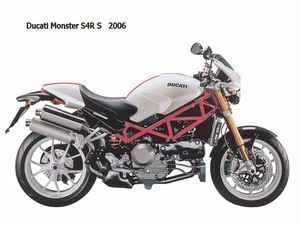 For unparalleled power, road holding and sheer excitement—all in a uniquely styled motorcycle that is distinctly Ducati—the Monster S4R S is the choice for discriminating enthusiasts. The liquid-cooled, 4-valve per cylinder, 998 Testastretta L-Twin engine features a 100mm bore and short stroke of 63.5mm to limit average piston speed and allow increased rpm. The result is a staggering 130hp and 10.6kgm of brute torque. This page was last edited on 21 August 2010, at 14:01.